Nicole's Needlework: Am I really going to attempt this??? I love quilts. I have always loved quilts. My grandma makes beautiful quilts. She has given me and the boys several, which I treasure and will treasure always. My mom also made me a HAND-STITCHED quilt. It's also beautiful. Made with all repro fabrics. I have always wanted to learn how to quilt, but have been too nervous (not to mention I don't really need another hobby). Anyway, while in Florida I bought a Moda Layer Cake in the Bistro line of fabrics. Wish me luck (if you don't know already - I consider myself the world's worst sewer!). can't wait to see it!!!! I have been so tempted by these myself! Love your choice of fabric!!!!!!!!!! Nicole, how wonderful! I am sure your first quilt will be just lovely like everything else that you do. I look forward to seeing you progress. Good luck Nicole! I can't wait to see it! You can do it Nicole!!! I know you can! You're so creative and talented. YGG! You definately have an eye for color. You will do a great job. Best of luck to you! I am a wanna-be quilter too, just as soon as I finish everything in my needlework "to do" pile. Your fabrics are great together! Go, Nicole! You can totally do it! Good job choosing such cute fabrics and a nice little pattern to start! These are really pretty!! I have always wished I could take a class. The International Quilt Festival starts in Houston on Oct. 15 and I am going to go for sure. They have some classes in there and I have always wished I could take one. Maybe sometime I will get to do that. A tabletopper sounds great for a start. Are you doin it by hand or machine? I will love seeing your progress! Have fun, Nicole! Quilting is highly addictive too - all those lovely fabrics! Another addiction to add to the fun pile! Good luck! I think it would make an adorable lap quilt too. How helpful am I, LOL. I bought my first quilting project yesterday, and am scared of it...but think I'll be okay once I get going. First, congratulations on finishing Finch's Song! It is beautiful!! Second, you will do SOOOOOO well at quilting. I just love the fabrics--it's going to be an amazing quilt. I've been quilting since last November. I just had my first stitching lesson last night! I really love learning new things and the fiber arts seem to have really captured my interests. Can't wait to see your quilt! The fabric is great! The table topper is going to look wonderful. I'm wishing you luck, but I don't think that you're going to need it. 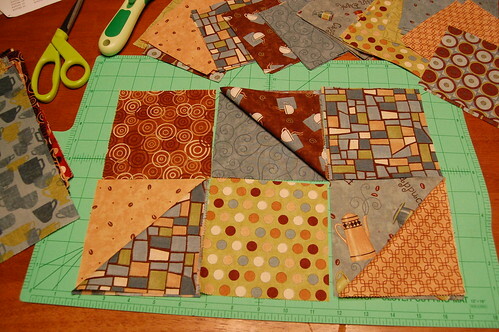 Everything looks great so far and can't wait to see those blocks all sewn together. You'll get through this one and then there will be many more to come. It's very addicting!! Lookin' good so far, Nicole, but then I have total faith in your abilities. I think you can do most anything. You've very talented. I can't wait to see it finished. Welcome to the world of Fabric - just remember, she who dies with the most fabric wins!!!! I missed your Finch song finish- Outstanding!!! Good luck with the sewing. Nicole! I can't wait to see what you are making! 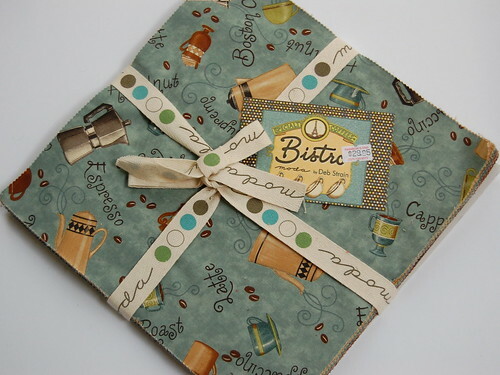 I love, love, LOVE those Bistro fabrics!! You are SO lucky to have quilts that your grandmother made..I'm envious. I can't wait to see your results! I love quilting and haven't done any in awhile. I really am itching to pick it back up. I hand quilt so I often send out the bigger quilt tops since it gets so hot sitting under a big quilt to work on it but I will quilt small wall or table topper quilts. Every time I visit a quilt store, I want to take up quilting, but I, too, tell myself that I don't need another hobby! I love the fabrics that you have chosen. They are beautiful. Good luck with your quilt!